The Leaf Pendant is a great way to add sculpture and art to your room while also adding the pure white light of a halogen chandelier. 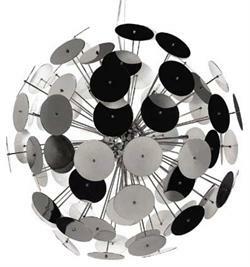 The Chandelier is a generous 25.6" round in diameter and has multiple arms that come out in various directions to form a near perfect sphere. The ends of the arms have high polish chrome discs to continue the feel of round shapes in this fixture. Perfect over a dining table, entrance, or in a great room.